Pleasure for both eyes and ears Its versatility makes the partition wall a classic. 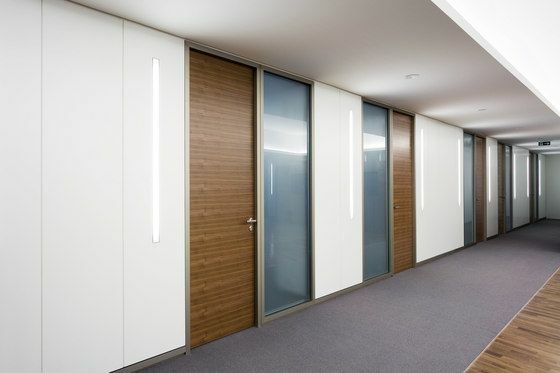 Melamine, laminate, veneer, textile or metal, standard or high sound insulation, with or without fire resistance – whatever version you are selecting, the visual impression is perfect. So is the acoustic quality, because even the basic version of fecowand achieves a sound insulation of Rw,P = 47 dB. Of course in all fire resistance ratings up to EI90. Only with the patented feco® clip system the wall panels are invisibly clipped to the partition wall uprights by means of clip rails running along the entire length. The advantages as compared to a simple point fixture are:Improved stability The inserted full-length clip rails form a solid connection with the partition wall upright, thereby increasing the strength. Proved by tests according to DIN 4103.More exact joints At the same time the partition wall panels are fixed in respect of lateral displacement. This ensures longitu- dinal stability and foremost a precise joint pattern.Higher acoustic insulation The full-length solid connections between the partition wall panels and the substructure result in excellent acoustic insulation.